Thirteen days ago, New England‘s offense was left for dead after a 41-14 drubbing by the Kansas City Chiefs. Those fears were overblown in a typical media firestorm that loves to make mountains out of molehills. Those worries have been allayed as the New England Patriots dominated the Buffalo defense in a 37-22 win on Sunday. It comes a week after they won 43-17 against the Cincinnati Bengals. For those keeping track, that is New England Patriots 80, opponents 39 in the last two weeks. It has started with none other than Tom Brady. He went 27 of 37 for 361 yards and touchdowns against the Bills. He got help from everyone including Brandon LaFell, Rob Gronkowski, Julian Edelman, Brian Tyms, and Tim Wright. Despite the high final score, it did not start out that way as neither team scored on their first two possessions. The Patriots had a chance to open the scoring on a field goal, but Stephen Gostkowski pushed it wide left. That miss came right after a false start penalty by Danny Aiken. The Bills quickly moved to the New England 49 yard line. That drive ended in a hurry when Jamie Collins picked off Kyle Orton at the 39 yard line. The Patriots took full advantage of the turnover when Brady hit Tim Wright in the back of the end zone for the one yard score to make it 7-0 Patriots. There was a lull in the action as neither moved the ball on their next drive, but Buffalo would tie the game with Orton’s 7 yard pass to Robert Woods in under 4 minutes remaining in the first half. After a Patriots punt, Buffalo got the ball back with 2:15 left. On the first play, Orton was hit and sacked by Chandler Jones, who also recovered the ball. New England had 3 straight incompletions and settled for a 42 yard field goal from Gostkowski to make it 10-7. The Patriots got another give with 14 seconds left. C.J. Spiller had a huge gain to the right, but was stripped by Devin McCourty and Zach Moore made the recovery. After a quick pass from Brady to Edelman, Gostkowski drilled a 53 yard field goal to make it 13-7 at the halftime break. The Patriots received the ball to start the third quarter and they wasted no time adding to their lead. Tom Brady’s 43 yard pass into triple coverage was caught by Brian Tyms. Buffalo had a response again with Orton using his arm to get the Bills down to the goal line. Fred Jackson pounded it in from a yard out to make it 20-14. New England came back with another Gostkowski field goal from 40 yards out to take a 23-14 lead. The fourth quarter was more of the same with the New England offense continuing to be unstoppable, but Buffalo was always within striking distance until late in the game. The Pats started the final quarter off with Brady hitting Brandon LaFell coming across on a little slant route. LaFell did the rest as the Buffalo defender was turnaround. That made it 30-14, but the Bills had yet another answer. Faced with a fourth and two from his own 40, Orton decided to go deep for Woods and it paid off with a 35 yard gain. Two plays after that, Orton hit Chris Hogan on the sideline for a touchdown. Orton then hit Woods on the two point conversion at the goal line and it was good. It was 30-22 at this point. 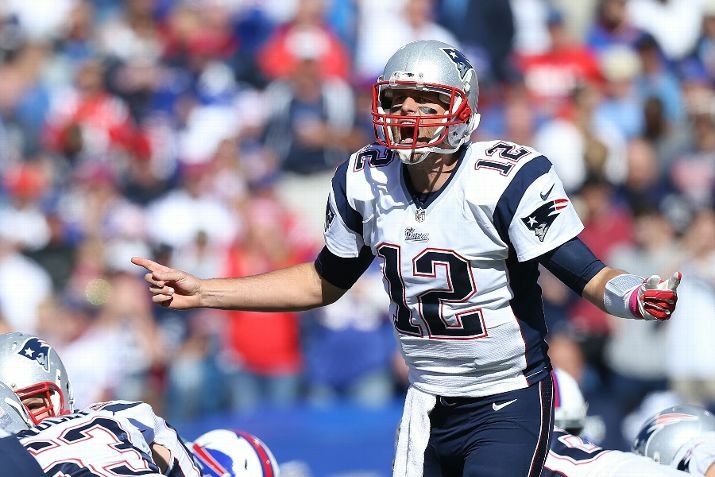 Just when it appeared that the Bills had a little bit of life, Brady slammed the door closed. He found LaFell open behind the defense for a 56 yard touchdown to get to the final score line of 37-22. The Patriots run game was very poor against the Bills. As a team they had 27 rushes for 50 yards with Stevan Ridley leading the team with 23 yards on 10 carries. That will surely have to change if the Patriots are to continue their offensive juggernaut ways in the immediate future. LaFell finished as the top receiver for the Patriots with 4 catches for 97 yards and 2 touchdowns. Rob Gronkowski had 7 catches for 94 yards, but there was also a concern of an injury. In the third quarter, Gronkowski hit the turf hard and appeared to hurt his shoulder, but he continued on after that. Julian Edelman caught 9 passes for 91 yards while Brian Tyms had that one catch for 43 yards and a score. Kyle Orton had a solid game by going 24 of 38 for 299 yards with 2 touchdowns and an interception. He was sacked 5 times for a loss of 31 yards as well. Like the Patriots, the Bills had a tough time running the ball though they did a bit better than their counterparts. The team ran for 68 yards and 1 touchdown on 23 carries. Fred Jackson had 10 carries for 26 yards and the touchdown, Anthony Dixon had 7 carries for 23 yards, and C.J. Spiller had 6 rushes for 19 yards. Scott Chandler had a big game at tight end with 6 catches for 105 yards. Robert Woods caught 7 passes for 78 yards and a touchdown while Chris Hogan had 5 receptions for 72 yards and a touchdown. New England (4-2) have a short week with their rivals, the New York Jets (1-5) coming to town on Thursday night. It will be interesting to see the combination of short rest and the rivalry matchup affect how well the Patriots do on offense. Buffalo (3-3) will welcome the Minnesota Vikings (2-4) to Orchard Park next week. The Bills are already 2-0 against NFC North teams this season with wins over Chicago (23-20 in Week 1) and Detroit (17-14 in Week 5). Both of those games were on the road. Below is the schedule for Week 8 in College Football. It is worth noting we have our first Tuesday game of the season with Louisiana-Lafayette traveling to Texas State in Sun Belt Conference action.